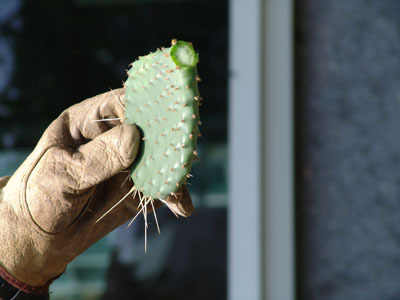 Propagating cacti can seem like a daunting task, but with a good pair of gloves it is a simple process. 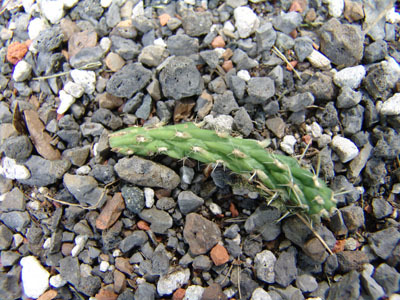 It is recommended that you propagate your cacti in late spring with the arrival of warmer, drier weather. This allows plants plenty of time to get established before the winter season. You will need a pair of pruners and the aforementioned gloves. 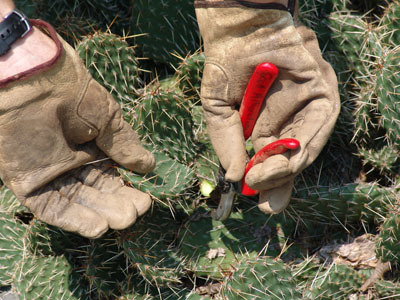 The gloves, of course, provide protection from the prickly spines that are a trademark of all cacti. 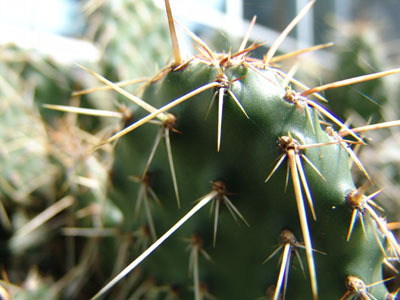 Be warned, while the average new cacti grower avoids the large, fearsome spines, the tiny, fine thorns cause the most pain. These almost microscopic thorns stick in all manner of clothing, causing continual pocks and pricks. If you do fall victim to their touch, you may be able to remove them by applying masking tape to the pull the thorns out. If your attire becomes severely entangled by these thorns, you simply have to discard the afflicted article of clothing. There are many war stories of having to discard various pairs of socks and pants because of these tiny menaces. Thus approach your cacti with great caution. Properly equipped with gloves, simply use your clean, sharp pruners to remove a pad where a joint forms with another pad. If you are sharing your pads with friends, simply wrap the pad in newspaper to give to a friend. 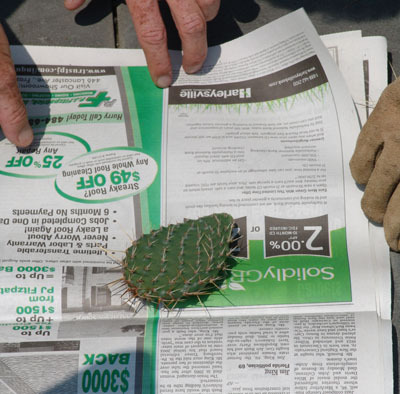 The newspaper makes sharing easier and less prickly. Store the pad in a dry location until ready to plant. No other care is required. Before planting, choose the appropriate location for your cacti. It should be a sunny, well-drained to dry location. It is recommended that you mix some gravel into your cacti garden soil to encourage good drainage and increase the porosity of that soil. 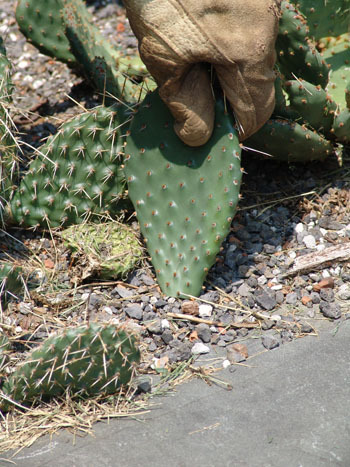 To plant your cacti cutting, place the pad upright in your garden or lay it on its side. Be sure to have the cut portion of the pad slightly touching the soil to stimulate rooting. No other care is necessary. You can also cut the pad in half to increase the number cacti you have. As a good gardener, you may be tempted to water the newly planted pad. Watering can cause the pad to simply rot. It will be happy with a sunny, dry location and no attention at all. This simple method of propagation mimics the conditions in the wild. Pads are often broken off and carried along by animals. Once a pad is broken off or is dropped by the animal on the ground, it will begin producing roots from the point of the break. Consider adding these prickly beauties to your garden. Visit the Scott Arboretum see the variety of hardy cacti for the Delaware Valley. Here in Michigan you have to watch out for the thorns on the wild roses…but I’ll tell you what-that ain’t nothin’ compared to what you are dealing with! Even people with brown thumbs can grow prickly pears (Opuntias). There are dozens of varieties to choose from. Short. Tall. Wide. Narrow. I put my plants outdoors on the porch in summer and they are happy as can be. In the fall I bring them in and mostly don’t water them. They sit dormant in my living room window. Thanks for the article. It makes me appreciate my plants all over again.